I have pleasure in presenting the Aspen R&N Co report for 2018. This report provides details in respect of the composition and activities of the R&N Co for the year, our remuneration policy as it relates to employees, executive directors and non-executive directors and how this policy has been implemented during the year. The information in this report has been approved by the Board on recommendation of the R&N Co.
while no director appointments were required during the financial year ending 30 June 2018, Linda de Beer was appointed on 31 July 2018. John Buchanan retired with effect from 31 July 2018.
issues raised as part of the evaluation process have been addressed by the Chairman. reviewed and approved the succession plans in respect of the Group Chief Executive, Deputy Group Chief Executive (Financial Director) and senior executive management. the award and vesting criteria for short, medium and long-term incentives in respect of the executive directors and senior executive management. considered and recommended the financial performance measures and the KPIs of the executive directors for the forthcoming financial year. reviewed the fees to be recommended to shareholders to be paid to our non-executive directors following an internal benchmarking study, excluding the fee to be paid to the members of the R&N Co as these fees are independently considered and recommended to shareholders by the Board. considered the recommendations contained in King IV as they relate to nomination and remuneration aspects and proposed initiatives to ensure the application of these recommendations as and where appropriate. considered our remuneration disclosure in the Integrated Report and whether this disclosure is accurate, complete and transparent. The R&N Co has formal Terms of Reference which are incorporated in the Board Charter and which have been approved by the Board of Directors. The Terms of Reference are reviewed and amended by the Board as and when required. The Committee has conducted its affairs in compliance with these Terms of Reference and has discharged its responsibilities contained therein. The R&N Co is satisfied that it has fulfilled its responsibilities in accordance with its Terms of Reference for the reporting period. The R&N Co consists of independent non-executive directors, one of whom chairs the Committee's meetings. Members and the Chairman of this Committee are elected by the Board. The Chairman of the Board is a member of this Committee and, while the Group Chief Executive, Deputy Group Chief Executive and Company Secretary & Group Governance Officer attend meetings by invitation, they recuse themselves from any deliberations in respect of their own remuneration or benefits. From time to time other executives of the Group attend meetings of the Committee, as requested. In accordance with the Terms of Reference, the Committee meets at least three times annually, but more often if necessary. During the current financial year, the Committee met three times. The minutes of these meetings are made available to the other directors on a secure electronic database. The Chairman of the Committee provides the Board with a verbal report of the Committee's activities at each Board meeting. Overall attendance at the R&N Co meetings held during the year was 100%. The Chairman of the Committee represents the R&N Co at the annual general meeting ("AGM") each year. The Company Secretary & Group Governance Officer is also the Secretary of the Committee. While no material concerns have been raised by stakeholders in respect of our governance processes, including our remuneration policy, in the past year, any concerns raised going forward will be considered and addressed by means of constructive engagement. Both our remuneration policy and implementation report will be tabled for separate non-binding advisory votes at the Company's 2018 AGM, scheduled for 6 December 2018. Policy provisions have been adopted to ensure that, in instances where either the remuneration policy or the implementation report are voted against by 25% or more of voting rights exercised, appropriate measures will be taken to constructively engage dissenting shareholders in order to address legitimate and reasonable objections and concerns raised or to clarify and adjust remuneration governance or processes. The nature and outcomes of these engagements will be reported on in our Integrated Report of the following financial year. Several initiatives have been implemented to improve the disclosure in respect of our approach to remuneration and the application of King IV and enhancements to this report reflect the progress made in this regard. While the Committee is satisfied that the objectives of the Group's remuneration philosophy and policy have been met in the year under review and that the King IV principles in relation to this aspect have been applied, further research is being undertaken into the financial well-being of employees, including aspects relating to the payment of a fair living wage, gender pay gap concerns which may need to be addressed and improving the socio-economic conditions of our lowest level employees throughout the Group. Succession planning in respect of the Group's executive directors and other senior executives has received increased attention during the year and will be an area of focus for the Committee in the year ahead. Part Two and Three of this report, respectively the overview of our remuneration philosophy and policy and the remuneration implementation report, are presented herewith for the consideration of stakeholders. We strive to retain our competitive advantage in the local and global pharmaceutical industry through the attraction and retention of high calibre individuals, who not only have the required technical qualifications and experience, but who also demonstrate the desired behavioural traits which fit our entrepreneurial and dynamic culture. We recognise that the appropriate remuneration of our executive directors, non-executive directors and our employees is inextricably linked to the attraction, development and retention of the Group's human and intellectual capital. the geographical market in which the employee is based. The remuneration philosophy is consistently applied across companies forming part of the Group. the transparent disclosure of our remuneration philosophy, policy and practices to stakeholders to provide them with an informed view of these aspects. medium-term and long-term share-linked incentive schemes. Attraction and retention of skilled and capable talent. Reviewed and adjusted annually based on benchmarking surveys, inflationary indicators and the achievement of individual performance targets. Delivered as a cash salary and a mix of compulsory and discretionary benefits. Creates a high performance culture through a cash bonus by rewarding employees for achieving predetermined performance targets. Granted annually upon the achievement of predetermined individual and business performance targets. Delivered as an annual once-off cash payment and subject to capping against base salary. Alignment with shareholder interests and retention of critical skills. Annual grants, predominantly linked to the performance of the Aspen share price, vesting over either three or 10 years, based on the achievement of predetermined individual and business performance targets. Delivered in Aspen shares (acquired on-market) or cash depending on the scheme. industry and regional benchmarking studies. Additional adjustments are considered in circumstances where the executive or manager has changed responsibilities or has relocated. Role of the R&N Co: Upon conclusion of the annual benchmarking and inflationary research, the Committee considers and approves the average percentage increase allowed in respect of each Aspen business. The Committee also reviews and approves the specific increase adjustments made to the base pay of selected senior executive employees, including the business leaders of Aspen’s material businesses and functions. Calculations of annual cash incentives and the caps in respect of these incentives are determined as a percentage of total guaranteed remuneration, modified according to the achievement of predetermined individual and business performance targets during the year. On-target annual incentive levels increase at higher levels of seniority, but are capped at differing levels. In the case of the executive directors, the award is capped at 100% of the base salary. For other members of executive management, the cap is 30% of the base salary (in some countries of employment, a lower cap is applicable). South African executives and managers are subject to the provision of the South African Management Incentive Bonus Scheme which applies a cap of 30%. Role of the R&N Co: In determining the award of the annual cash incentives, the R&N Co has the discretion to exclude factors and extraordinary events which are beyond the control of the Group, but which may nevertheless favourably or adversely impact the Group’s performance. Accordingly, extraneous factors may be excluded in the calculation of incentives for the executive directors and other members of executive management, at the discretion of the Committee. The approval of annual cash incentives of certain selected senior executives (predominantly business and functional leaders) falls within the discretion of the R&N Co. A further discretionary bonus may be paid in cash to employees who are considered by the R&N Co to have rendered exceptional service in any given year. The scheme is designed to acknowledge performance and reward individuals for achievement of both the relevant Aspen business which employs the individual and the individual’s performance for the trading period immediately preceding the date that the award is made. While it has the same performance measures as the annual cash incentive, it introduces a retention element through the three-year deferral to ensure that critical executive and professional skills are retained and that there is congruence between the interests of executive and managerial employees and shareholders. Alignment between shareholder and employee interests has been successful as most eligible employees have historically elected to receive the value of the award in Aspen shares (2018: 93%, 2017: 96% and 2016: 97%). The award value varies according to the level of seniority of the executive or manager and is determined according to the achievement of the same performance targets which apply to the annual cash incentive. The maximum award does not exceed 33% of the total remuneration cost in any instance, except for executive directors’ awards which are capped at a maximum of 41,25% of their total remuneration cost. To encourage the holding of shares within the Company, an enhancement of 10% is given to employees who elect to receive the award in shares. Awards are deferred for three years, and eligible employees are given the choice at the date of the award to receive the deferred bonus in cash or Aspen shares. To the extent that an employee elects to receive shares pursuant to the award, share awards are acquired and held by the Aspen Share Incentive Trust (in respect of awards made up until 2015) and an unrelated intermediary (in respect of awards made from 2016 onwards) to enable Aspen to settle its future obligation to participating employees upon vesting. No shares are issued in terms of this scheme and it has no dilutive effect. Should the employee retire within the three-year period, the vesting of the awards will be accelerated to the date of retirement. Employees who resign or who are dismissed for any reason other than retirement, retrenchment or medical incapacity forfeit unvested awards. The Aspen South African Management Deferred Incentive Bonus Scheme is aimed at the retention of a limited number of key senior executives. The value of the awards granted to employees in terms of this component of the scheme is on an ad hoc basis and at the discretion of the R&N Co. These awards vest after a period of 10 years and may only be settled in shares. Awards made in terms of this component of the scheme will not be accelerated in the event that a recipient retires within the 10-year period and before the age of 65, unless the express approval of the R&N Co has been obtained for such acceleration. In order to incentivise the management of Aspen’s non-South African businesses in the medium term, a phantom share scheme exists for selected employees. Awards are linked to performance of the employee, the business and growth in the Aspen share price. The value of awards that can be awarded annually in terms of this component of the scheme is capped, with this cap varying according to the level of seniority of the executive or manager and territory of employment. The phantom shares entitle eligible employees to receive a cash amount which is linked to the Aspen share price. Awards vest after a period of three years and are paid out in cash to the employee by the Aspen business employing him or her. Should the employee retire within the three-year period, the medium-term incentive will be accelerated to the date of retirement. The Aspen International Phantom Share Scheme is aimed at ensuring the retention of a limited number of key offshore senior executives. The value of the awards granted to employees in terms of this component of the scheme is on an ad hoc basis and are determined at the discretion of the R&N Co.
Role of the R&N Co: In determining the medium-term and long-term incentive awards, the R&N Co has the discretion to exclude factors and extraordinary events which are beyond the control of the Group, but which may nevertheless favourably or adversely impact the Group’s performance. Accordingly, extraneous factors may be excluded in the calculation of incentives for the executive directors and other members of executive management at the discretion of the Committee. The approval of the medium-term and long-term incentive awards of certain selected senior executives (predominantly business and functional leaders) falls within the discretion of the R&N Co. The rules in respect of our management incentive schemes, and any change thereto, are approved by the R&N Co.
Benefits vary from country to country depending on customs and regulations. Benefits include retirement funding, medical insurance and life and disability insurance. A limited number of employees in South Africa are entitled to post-retirement health benefits (as a consequence of contractual obligations assumed from predecessor companies). 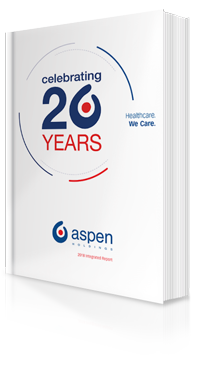 Aspen has never offered post-retirement health benefits, but has assumed obligations for post-retirement health benefits through various acquisitions. In respect of retirement benefits, the Group generally contributes to employee retirement funding. The extent of its contributions varies from country to country, depending on the state social security contributions and benefits in the country concerned. making payments to executive directors in the event of a change of control of the Company. 2. the reduction in the leverage measurement to levels below 4,0 based on a scale approved by the Board. The weighting of this portion of the incentive is 30% of the total incentive. implementing and maintaining appropriate business and reporting systems. The executive directors have, to date, always elected to receive their deferred incentive awards in shares as opposed to cash. The graphs below provide an indication of short-term and medium-term incentives payable to executive directors in respect of the 2019 financial year where performance against the above performance metrics may either be achieving performance targets, achieving 50% of performance targets or not achieving performance targets at all. No additional incentive payments are applicable in instances of performance above expectations. Non-executive directors do not receive any bonuses, share options, incentives or other payments in addition to their directors' fees. Following research and a benchmarking exercise conducted into trends in non-executive director remuneration among companies of a similar size and complexity to the Group and the duties performed, non-executive directors' fees are proposed by management to the R&N Co. After review of such proposals, the R&N Co makes appropriate recommendations, other than for fees for services paid to the R&N Co, to the Board. The proposal endorsed by the Board is tabled for approval by shareholders at the AGM. The Board has proposed a general fee increase of 6% for the 2019 financial year in respect of the attendance and retainer fees paid to non-executive directors. The fees payable to these directors through to the AGM in 2019 will be submitted for approval at our annual general meeting to be held on 6 December 2018. The Chairman of the Board receives a fixed annual fee for his role as Chairman. Non-executive directors' fees are fixed for the year. A quarterly base fee is payable to each non-executive director, in addition to a fee per meeting attended. Further fees will be paid for attendance at unscheduled meetings dependent on the number of hours spent at the meeting, up to a maximum of the set fee per meeting. In the instance of non-attendance, non-executive directors are obliged to continue to participate in meetings by providing the Chairman or the Committee Chairman with detailed inputs for all agenda items. The R&N Co has discretion to approve payment of such fees to a non-executive director notwithstanding his/her absence from a meeting under special circumstances. The remuneration policy will be subject to a non-binding advisory vote at the annual general meeting to be held on 6 December 2018. The policy is reviewed annually and the opinions of shareholders are an important consideration during these reviews. The R&N Co's Terms of Reference have been updated to allow for prescribed processes to be followed in instances where this policy is voted against by 25% or more of the voting rights exercised, including measures to engage with dissenting shareholders to ascertain the reasons for the dissenting votes and to address legitimate and reasonable objections and concerns raised. These engagements and steps taken as a result of these engagements would be reported upon in the next report of the Committee. Shareholders not in favour of this part of the report are requested to raise their concerns with the Company Secretary prior to voting in order for the concerns to be considered. These may be submitted by email to rverster@aspenpharma.com. This section of the report provides an overview of the implementation of the remuneration policy as it applies to executive directors and non-executive directors. Please refer to the table above of this report for a summary of the remuneration activities undertaken by the R&N Co during the year. ensuring that an effective risk management and reporting process is maintained. While both executives achieved the full 30% weighting in respect of their achievement of their respective KPIs (measure 3 above), the performance measures in respect of 1 and 2 above were not fully met, resulting in both executive directors achieving 32% out of a possible 40% in respect of measure 1 and 6% out of a possible 30% in respect of measure 2. As a result, both executive directors achieved an overall rating of 68% and have had their short and medium-term incentives adjusted accordingly. The deferred incentive bonus shares have a maturity date of three years on acceptance of the bonus. In line with the requirements of the Companies Act, the fees payable to the non-executive directors for the financial year were approved by a special resolution of Aspen's shareholders at the Company's AGM held on 7 December 2017. ** Babalwa Ngonyama receives an attendance fee for attendance at meetings of Aspen Finance (Pty) Limited, in her capacity as Chairman of the A&R Co of Aspen Pharmacare Holdings Limited. # Maureen Manyama resigned from the Board with effect from 7 December 2017. The remuneration policy will be subject to a non-binding advisory vote at the annual general meeting to be held on 6 December 2018. The policy is reviewed annually and the opinions of shareholders are an important consideration during these reviews. Shareholders not in favour of this part of the report are requested to raise their concerns with the Company Secretary prior to voting in order for the concerns to be considered. These may be submitted via email to rverster@aspenpharma.com. None of the directors held any non-beneficial shares in the Company at 30 June 2018.